This has been a good year for the stock market so far, at least in the U.S., yet many investors are wondering when the other shoe will drop. We spoke with Louis-Vincent Gave, founding partner and CEO at Gavekal Research, about the explosion in near junk corporate debt and why this is a problem during the next economic downturn. The situation that’s developed is concerning. With the growth of exchange-traded funds (ETFs) in the corporate bond space, we have players that are guaranteeing daily liquidity in an asset class that historically doesn't always guarantee liquidity. Today, if investors need liquidity in a hurry, they're essentially on their own, Gave stated. Meaning we might notice a dislocation in corporate bonds, keeping in mind that we’ve seen record issuance. 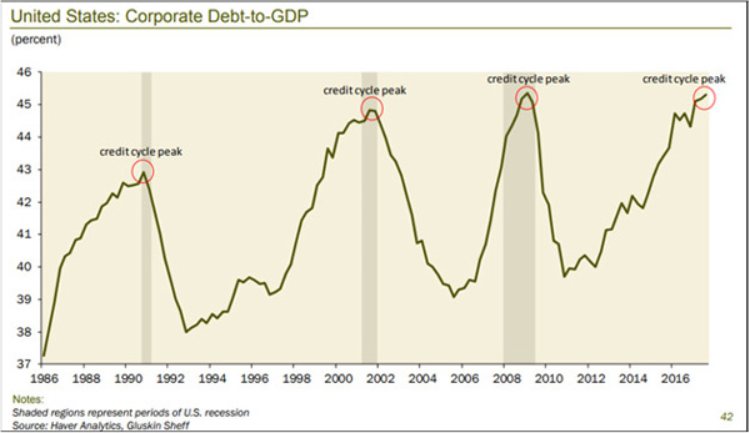 Normally corporate debt relative to GDP makes highs at the bottom of the cycle when GDP is shrinking and everybody's tapping their credit lines. Corporate debt relative to GDP is extremely high, and interestingly, Gave noted, the amount of debt that’s grown the fastest is just one notch above junk. During the next recession the number of companies that will be downgraded will lead to forced selling by institutions. This is one of Gave’s greatest concerns today. We’ve had a semi-crisis in emerging markets this year and U.S. bond yields have come down, which normally provides some cushion to the system. This is the first time in Gave’s career where U.S. bond yields have gone up while emerging markets were under pressure. Gave asserted the setup is likely to lead to the dollar losing value. For one, in the next market downturn, the Fed will become the buyer of last resort in the corporate bond market. Which will then drive the US dollar lower. Additionally, the situation with U.S. debt may exacerbate the issue. Listen to this full podcast with Louis Gave by clicking here. For more information about Financial Sense® Wealth Management and our current investment strategies, click here. For a free trial to our FS Insider podcast, click here.